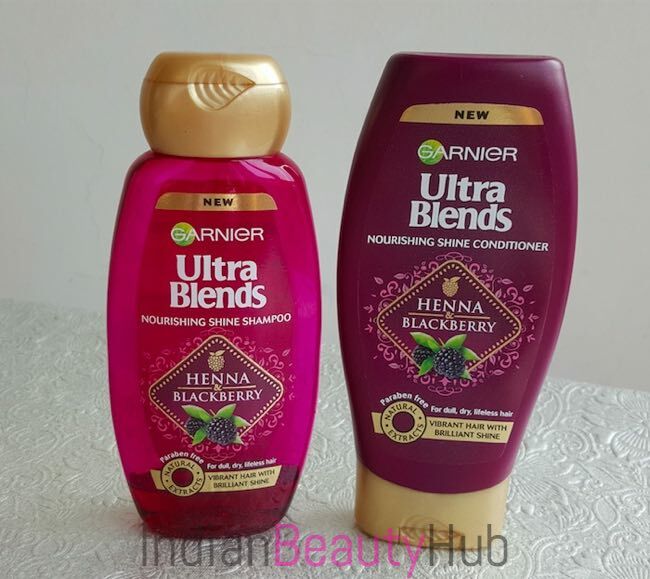 Hey everyone, today I’m reviewing the Garnier Ultra Blends Henna & Blackberry Shampoo and Conditioner. 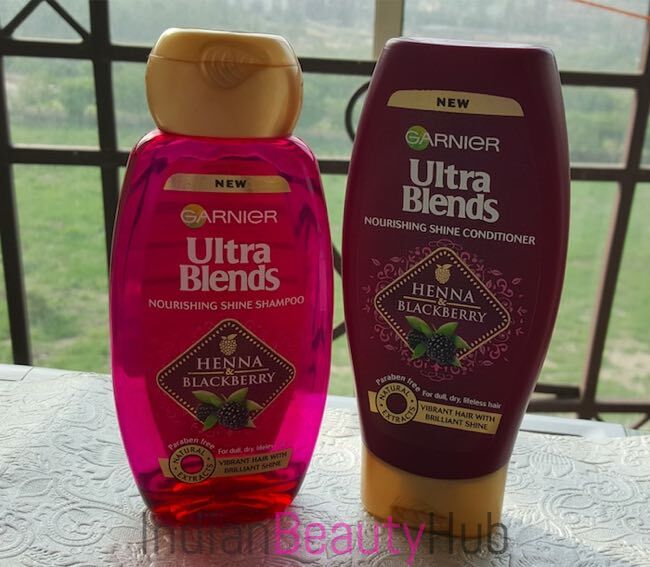 Garnier India recently launched their Ultra Blends hair care range in the Indian market. This new range include 5 variants – Royal Jelly & Lavender, Henna & Blackberry, Soy Milk & Almonds, Mythic Olive and 5 Precious Herbs. I’ve already shared the brief review of all the 5 variants, you can check that post here. 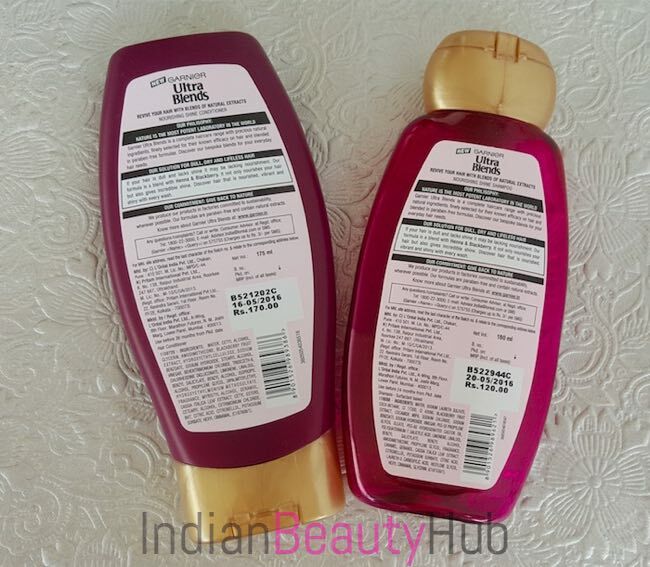 Packaging: Garnier Ultra Blends Henna & Blackberry Shampoo comes in a tinted purple bottle with a golden flip cap and the conditioner comes in a flat bottle with golden flip cap. 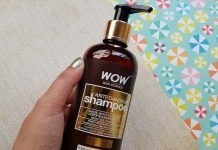 The shampoo comes in a see through bottle so you can easily see the remaining product inside the bottle whereas the conditioner has an opaque bottle packaging. 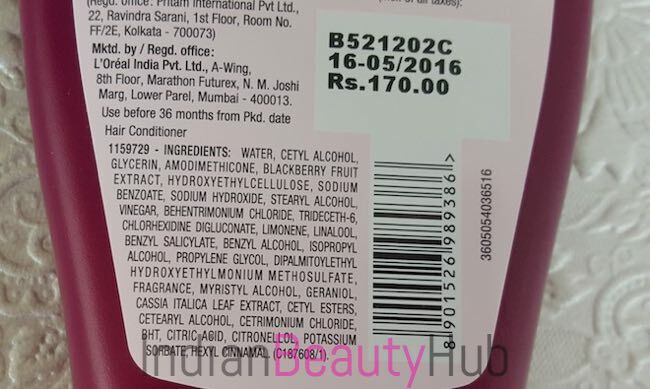 All the important product related information is also mentioned on the bottles. Overall the packaging is sturdy, hygienic and very convenient to use. 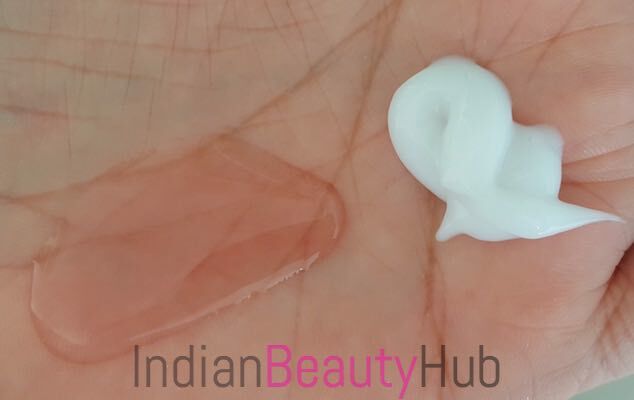 Texture & Fragrance: Garnier Ultra Blends Henna & Blackberry shampoo comes in a gel form and has a tinted purple color whereas the conditioner comes in a milky white color and has a cream like consistency. Both shampoo & conditioner have a pleasant fruity-floral fragrance that stays on the hair for 2-3 days. 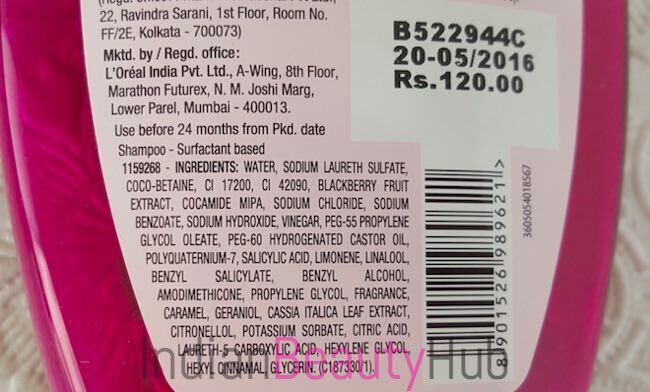 Price & Availability: The price of the Garnier Ultra Blends Henna & Blackberry Shampoo is Rs.55 for 75ml, Rs.120 for 175ml and Conditioner is Rs.75 for 75ml, Rs.170 for 175ml. 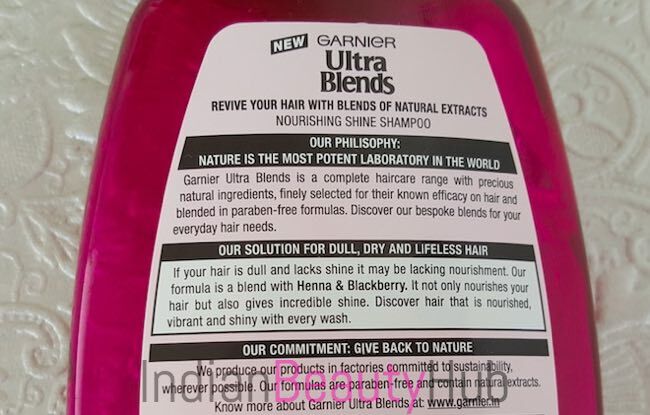 Garnier Ultra Blends hair care products are easily available at local departmental stores and also online at Nykaa.com and Amazon.in. My Experience: I’ve very thick and dense hair and I’ve to shampoo my hair twice during each wash to make sure my hair & scalp are properly cleaned. I usually dilute this shampoo with water and then massage it nicely on my wet hair & scalp. It is a gel-based shampoo that produces the rich lather and cleanses the scalp & hair thoroughly. It effectively removes dirt, oil, dandruff & other buildup and leaves my hair clean & refreshed. After rinsing it off, I take a generous amount of the conditioner and apply it evenly on my hair lengths. I leave the condition on for about 5 minutes and then rinse my hair thoroughly with fresh tap water. After towel drying, my hair becomes very soft, shiny and manageable. This shampoo conditioner combo does control frizz partially and my hair looks more healthy & nourished. 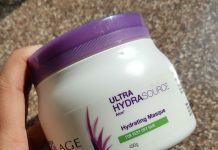 Overall I really liked this Ultra Blends combo despite it is unable to completely control frizz & tame flyaways (a good leave-in cream can handle that problem :) ). 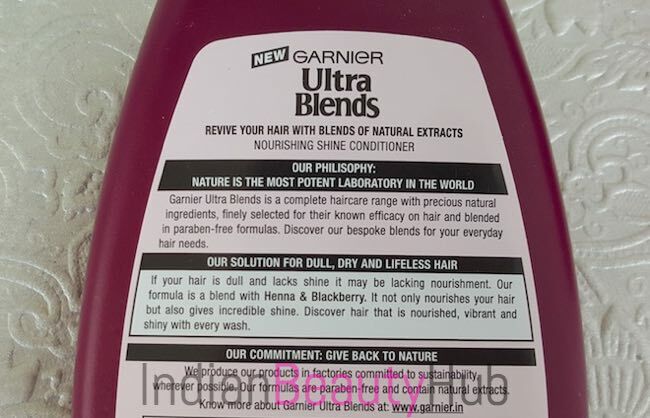 Garnier Ultra Blends Nourishing Shine range is enriched with Henna (known for its deep conditioning & nourishing action) and Blackberry (rich in anti-oxidants and vitamin C). 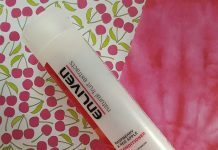 The shampoo cleanses the hair & scalp nicely and the conditioner provides nourishment to the hair. The combo makes hair soft, shiny and nourished. Both the products have a pleasant fragrance that lingers on till next hair wash.
Didn’t cause any hair fall. Garnier Ultra Blends range is free from Parabens. Suitable fro dry, dull and rough hair. Quite affordable and the quantity provided is also very decent. Not very effective in taming frizzy and unruly hair. The bottles are not spill-proof and you need to secure the caps with tape in case you are planning to carry these along while traveling. 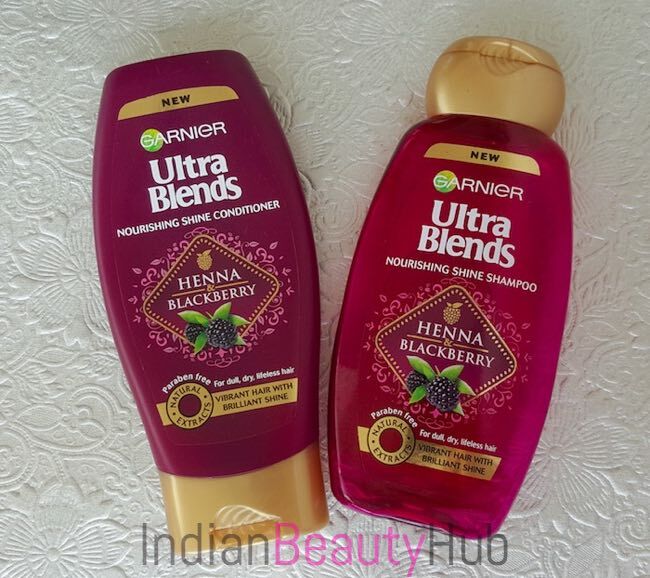 Overall Garnier Ultra Blends Henna & Blackberry combo worked really well for my hair. The shampoo cleanses the hair & scalp effectively and the conditioner makes my hair soft, manageable and shiny. Its refreshing fragrance is another plus point that will linger on the hair for 2-3 days. Recommended! Hi! Have been reading your posts since a long time and loving it. I have super dry and frizzy hair. What according to is the best shampoo and conditioner for thoroughly taming frizz and flyaways? Hey, thanks for your kind words. You can either try BBlunt shampoo & conditioner for damaged hair or TRESemme Botanique Nourish & Replenish Shampoo conditioner.